Yes, I can't get enough of them. For me, sewing with my friends is the best relaxation I can find. AND, I get something done. All good. I've had a wonderful fall. First I attended a two day marbling class at Center for the Book in San Francisco. It was given by a professional and very talented instructor by the name of Pietro Accardi. The first day we learned to marble on paper. The second day, and this is what I came for folks, we learned to marble on cloth. Yikes what a fun class. I'm kinda hooked although I can't see myself making and wearing a lot of garments from marbled fabric. But I love the color and design so much. Here's the start of a piece. Paint is squeezed onto a gelatinous surface in multiple circles. Then it is manipulated several times to make one of the multitude of designs. This is one of the more traditional designs, ready for the cloth to be placed on top. And then there are my designs. If you try to teach me anything you'll be sorry because I never want to do exactly what is being taught. It's hard wired into my psyche I guess. I love these big voluptuous designs. 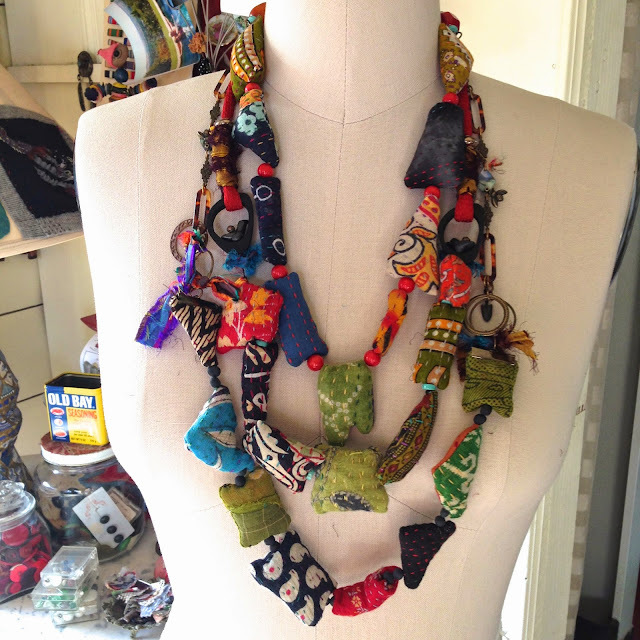 One of the great things about this class is that you are able to produce so many pieces! There's color and pattern everywhere...it's intoxicating. I recommend this class to anyone, so fun and achievable. I've done a bit at home, too (see results below). I made bias tape out of one fabric piece and like it very much. It's going to be good for gifts and to wrap around flowers I give from the garden. Several weeks later I attended an annual sewing retreat in San Juan Bautista. Great fun with 20 of my sewing pals. I look forward to it every year. I made this sweatshirt from a thrift store white cotton men's sweatshirt that I marbled. It actually worked! I had to cut it up first to fit it into the marbling tray, then sew it back together to fit me. Then it was on to Ashland to Design Outside The Lines with the amazing Diane Ericson. I'm always astounded by her abilities to create new shapes. She's a combination of engineer and artist...a good combo indeed! Halloween hit while we were there. 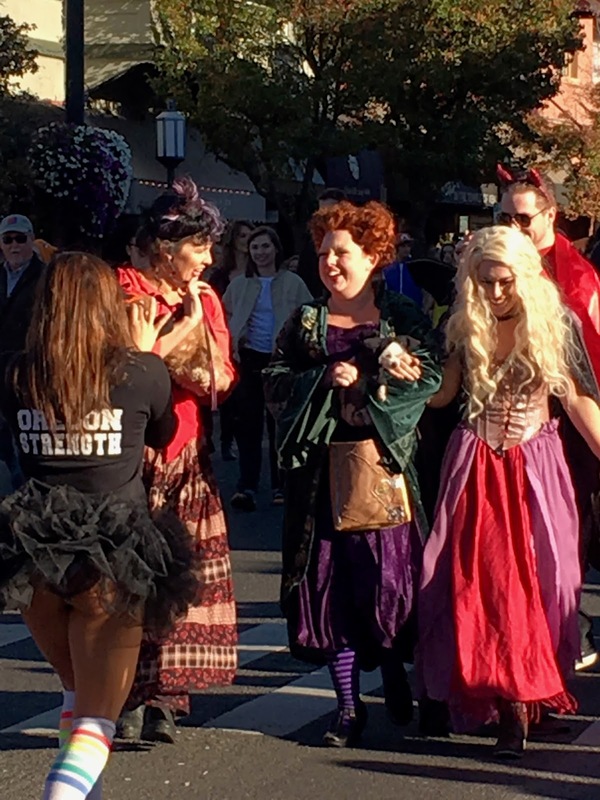 Geez, I thought Santa Cruz went all out for Halloween but Ashland puts us to shame. The parade lasted about an hour! Here are three lovelies having a whooping good time. Several of us got our hair cut by the talented Crystal. Here's Sham's getting shorn...so cute! And here she is showing everyone her new do. And then it was back to work! Kathryn Brenne was the other teacher for the week. Such a wonderful teacher and so talented. Her garments are all couture quality and she's fascinating to watch and learn from. DOL is so worth attending. If you've been thinking about it you shouldn't wait, just do it! And If you've never heard of it check it out! And last but not least, I just got home from a day of sewing with my local pals. We had a class from local artist, Diane Ritch. A very talented woman who works in all kinds of different art forms. Today she was showing us how she makes her darling little needle cases. She brought the inside parts, including a bevy of needles, to tuck in when we finished. Here are mine sitting atop my new little darling...a pale green Singer Featherweight I got at a yard sale. This was her maiden (for me) voyage and she did very well. This is going to be my travel machine from now on for simple projects. Here's part of the crew setting up. Diane is second from the right. Here are the fabrics I brought to work with. And here are our finished cases...minus Anne's who had to leave early. Mine are the two at the bottom left and center. The red one is home dec fabric I stenciled years ago. The inside "leaves" are made of beautiful thick felt or felted sweaters. I want to tell everyone that is within earshot and who has a love for textile art to high-tail it Cabrillo College for the current show at the Cabrillo Gallery. Cabrillo College is located on the Central Coast of California in Aptos, a hop, skip and a jump from my Capitola home. I'm so lucky to have this college near me for a lot of reason. One is this gallery, another is the many fiber/textile classes they offer in their Extension Classes. Be sure to check those out, too. This show is curated by Beverly Rayner, it's a knock out! There are so many jaw dropping pieces I can't pick just one or two. I don't know how she did it but she found so many fiber artists of superior quality. The show is super fun, try not to miss it! 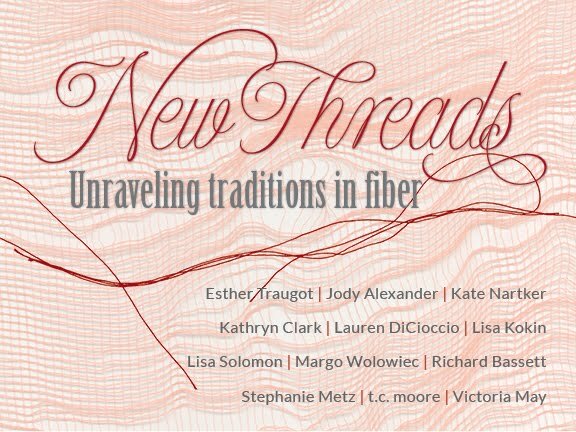 Please join us for the opening reception of New Threads: Unraveling traditions in fiber. Admission is free and the gallery is accessible to all. Parking is available on the street and in paid lots during the week and is free on weekends. The possibilities in the use of fiber as an art medium have exploded in recent years. More and more artists are harnessing the materials and craft of textiles that have been handed down through countless generations to explore new forms and communicate utterly contemporary issues and ideas. The artists in this exhibition reinterpret conventional approaches to the use of fiber in surprising, inventive, expansive, or subversive ways. Imagine a short film made from woven images; shredded currency stitched together into a brocade pattern; a grouping of bees, each in a tiny custom crocheted wrap; a sculpture that is half horse hair, half shadow; a drawing rendered in wool on paper; cowboys constructed from lace; or embroidery mapping the drift of toxic radiation from a nuclear reactor meltdown. Things aren't like they used to be! In late June I was lucky enough to attend Dorothy Caldwell's Mark Making class at Shakerag Workshops in Sewanee, Tennessee. 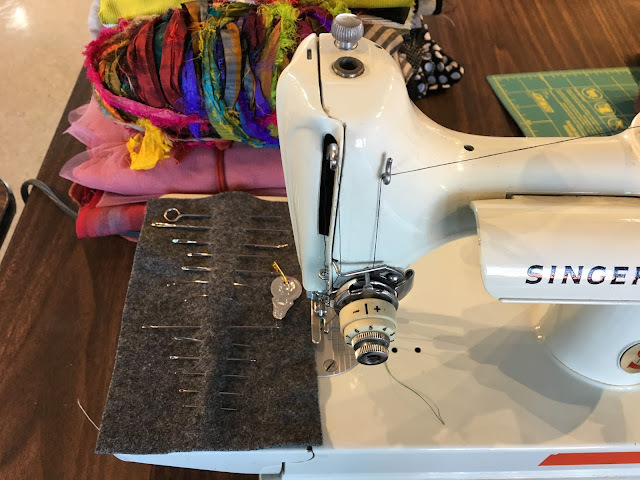 I met three of my sewing buddies, Sharon, Sarah and Holly for a time of pure bliss. Shakerag is a summer arts program at a private high school on the campus of the University of the South. Attendees live in the dorms, eat in the dining hall and take classes all day for an entire week. Just being in Tennessee was magical. The folks there are friendly...with a capital "F". So warm and welcoming. The campus is gorgeous, the meals were insanely wonderful. In fact, I am bringing their two head chefs to my bakery/restaurant in July of next year to cook for our customers, they will love their southern food. Every meal was better than the last. Hush puppies, stewed greens, lots of vegetables right from local gardens, meats from local pastures, we couldn't have asked for better food. And Dorothy's class was a meaningful experience. Her term Mark Making refers to the shapes we make with our hands, whether using a brush, a pen/pencil or a needle and thread. Dorothy explaining one of the many techniques we used to create pages for books we assembled later in the week. One of our assignments hanging to dry. Each of our assignments, after completed, was hung together with the other classmate's and together they were very powerful. This one used our fingertips. This assignment used brushes on bamboo poles with the paper on the ground. Using our whole bodies we made shapes with India Ink. So fun and surprising. We burned holes in paper with incense and smudged paper with soot from candles. The inimitable Claire Reisham, the founder of Shakerag Workshops giving us instructions for the day to come. She is one powerful woman. Her energy and spirit sets the tone for the week. The gorgeous dining hall. A pleasure to dine in. Our first finished assignment, little bound books made from scraps of paper. After our week (and believe me we didn't want to leave! Were all signed up for next year already!) the four of us piled in the car and headed to Alabama for a day in Florence to visit the Alabama Chanin Factory. On the way we needed to find somewhere to have breakfast. We were traveling the Nachez Trace. Holly found us a true southern breakfast in a little town along the way. It was Father's Day Sunday. It was a traditional southern cafeteria-style buffet with every imaginable thing on the groaning table. So good!! And finally we got to the Factory. First ,we sat down for another meal. It's lucky for me I travel with women who like to eat as much as I do. Everything was delicious, but the biscuits that Natalie Chanin's son created were out of this world. We asked her if we could come back for one of her sewing classes and learn how to make the biscuits, too. She said yes! Above is a shirt that I fell in love with. We really enjoyed our day there. Bought lots of fabric and had patterns made for us that would be shipped. I've got three scarves in the works. I wasn't home for a week when Joe and I took off for three weeks in Montreal and Nova Scotia. While in Montreal we caught the Gaultier wedding dress retrospective, 'Love Is Love", at the Montreal Museum of Fine Arts. Much like the show I saw twice in San Francisco, it had talking mannequins. Loved the whole experience. One thing I didn't find in Montreal was a clothing shop. No inspiring clothing anywhere...maybe I just missed it. Can't imagine they don't have style there. But I did see this cool vintage sewing machine that had been sprayed silver. It was in the window of a clothing designer upstairs. We fell in love with Nova Scotia. We put 2,100 miles on the Jeep. NS is worth visiting. The people are super friendly, the shellfish is everywhere and utterly fresh and delicious. The landscape is fascinating with little fishing villages tucked into deep coves everywhere. We really had fun. Here you see the cottage of the famous Nova Scotia artist, Maude Lewis. The whole cottage has been transported to the Art Gallery of Nova Scotia museum in Halifax. I'd visited once before and wanted to show Joe. Little did I know that Maude has had a comeback and is very popular right now. There's a wonderful movie out right now called Maudie. If you haven't seen it I recommend you do. She was extraordinary, very inspiring. We also visited two other replicas of her home in various parts of NS. And the museum has a large show right now with dozens of her works loaned by a collector. Ok, enough of where I've been. I've not been sewing much, as you can imagine, but did manage to make this shirt. 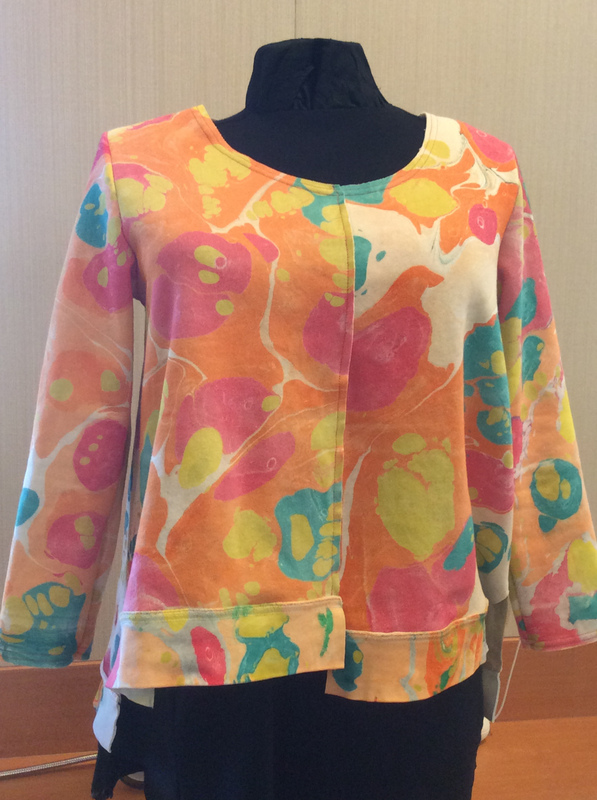 Designed by Katherine Tilton, B6459 is a fun shirt to make. Here I used three scrap fabrics to see how the pattern fit. I really didn't expect I'd like the mix of fabrics but I do. The body is fabric leftover from another garment I made, the light blue is some quilting cotton I got at the Expo in Puyallup cuz I loved the octopi, and the sleeves/collar are Indian hand blocked cotton I got at MAIWA while there for a class. 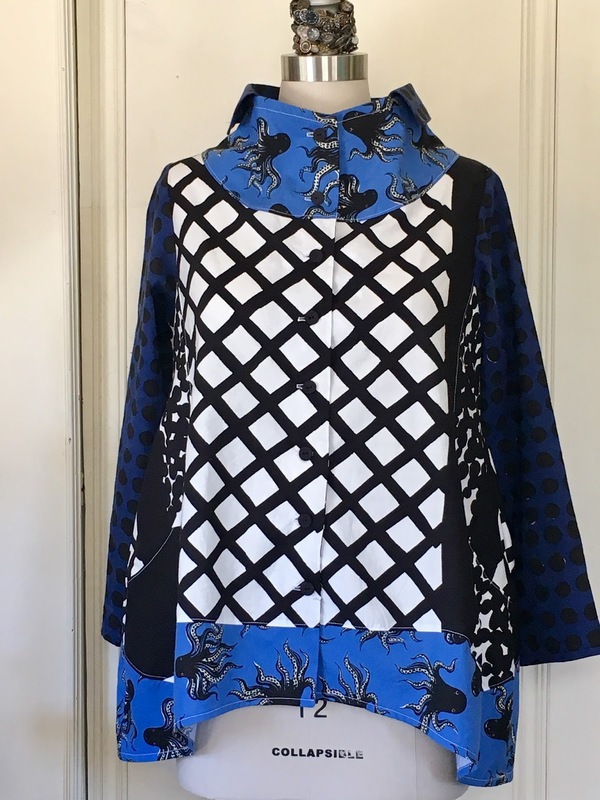 This pattern has lots of details that are fun to put together and looks really good on. I recommend this pattern!! That's all folks, more when I can get back to the workroom. Enjoy the halcyon days of late summer. I sure am!